Writers who attend our circles find that their writing improves through this interaction, and frequently the writing circle helps them through the dry and stagnant stages that happen to all writers. By participating in a CAA–NCR writing circle, you have your writing validated and improved by other supportive writers—and it’s a lot of fun. Participation is FREE, to members. The cost is $75.00 per year for non-members. 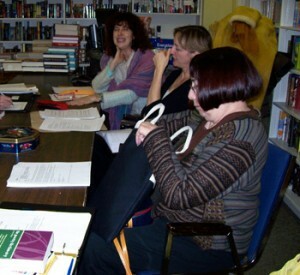 Members may join more than one writing circle. 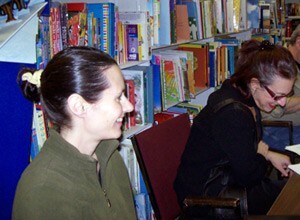 More more information, contact us at NCRadmin@canadianauthors.org. The concept of writing circles (by many names) has been around since people began to write. These circles have grown from a simple gathering of a few people sitting along the lakeshore to more elaborate gatherings in church basements—and, yes, even bars and taverns. Many of these precursors were not as positive and supportive as our circles of today. Writing circles are gatherings of writers who help each other to build better stories–to tame the errant paragraphs, fix the runaway punctuation and soften the unbecoming personality traits in a literary character. Since writing is usually done in isolation, writers often lack the networking contacts that offer support and advice on their efforts. Grandma and Uncle George may think the work is the best thing since the motorcar started exceeding 30 miles an hour, but is it? Writing circles allow writers to give and receive constructive feedback and to encourage each other in the challenge of writing that next bestseller, major script, book of poetry or memoir. Participants learn as much giving constructive feedback to others as they do receiving it. Works-in-progress are circulated among circle participants prior to the meeting. uing feedback is shared in a comfortable, safe, supportive environment based on an established format, and guidelines that have proven to work. Depending on the agenda, there may also be writing exercises which challenge members to stretch beyond their comfort zones. Exercises often reveal hidden talents or encourage members to expand their writing repertoires into new genres. Don’t worry about a bruised ego. Writing circles are guided by experienced leaders who ensure that critiquing is delivered in a positive manner that is constructive to the writer.